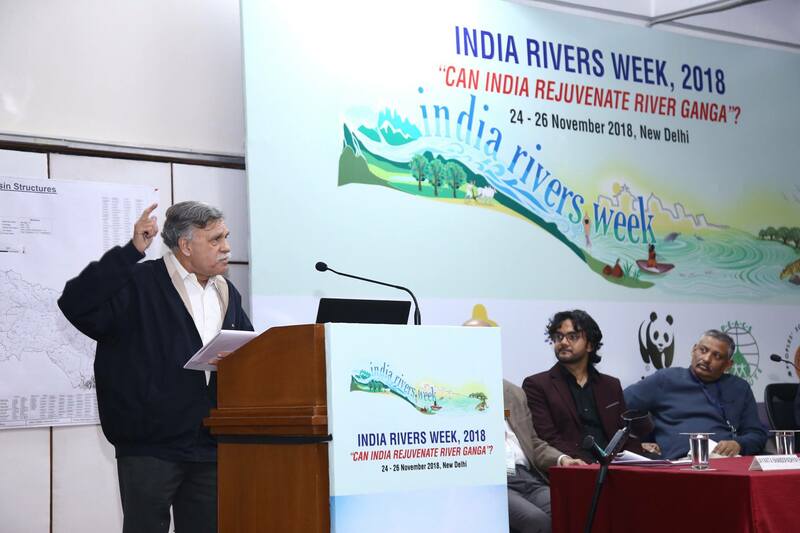 The theme of this year’s event, which was dedicated to Swami Sanand (aka Prof G D Agrawal) was ‘Can India rejuvenate Ganga?’. 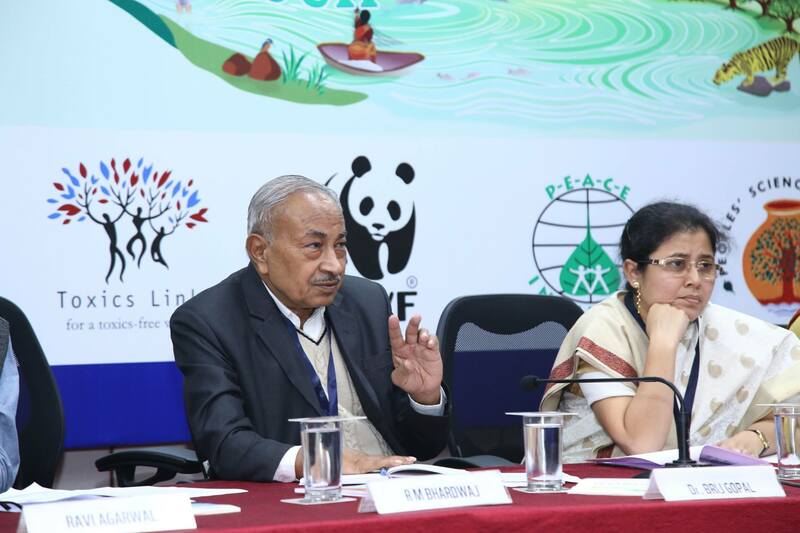 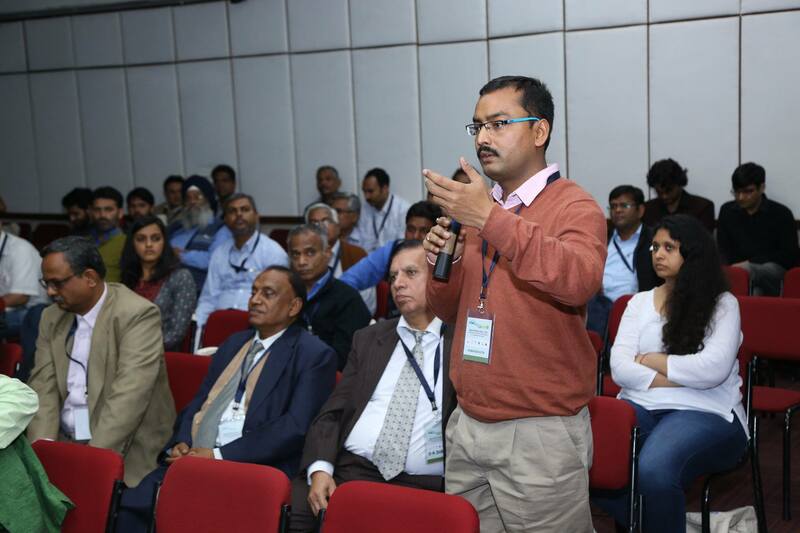 The programme was spread over three days, 24th to 26th November 2018 and was held at WWF India, New Delhi. 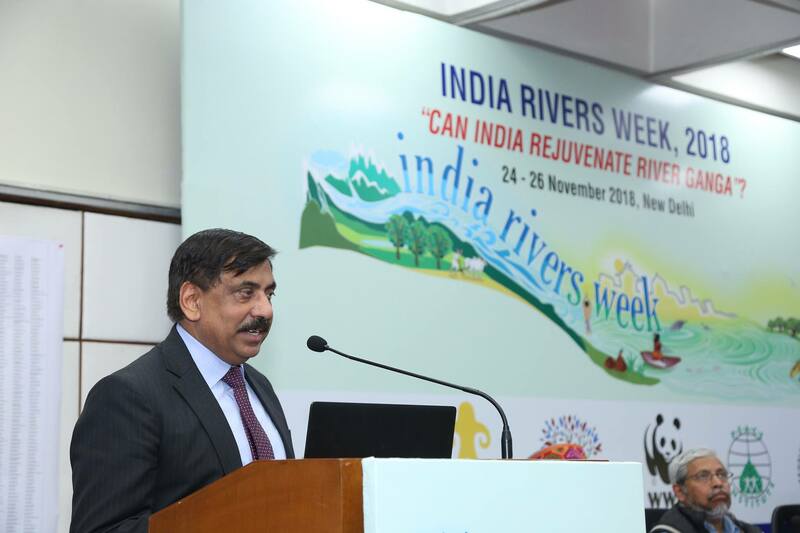 Chief Guest, Shashi Shekhar, Former Secretary, (MoWR, RD & GR), addressing the house. 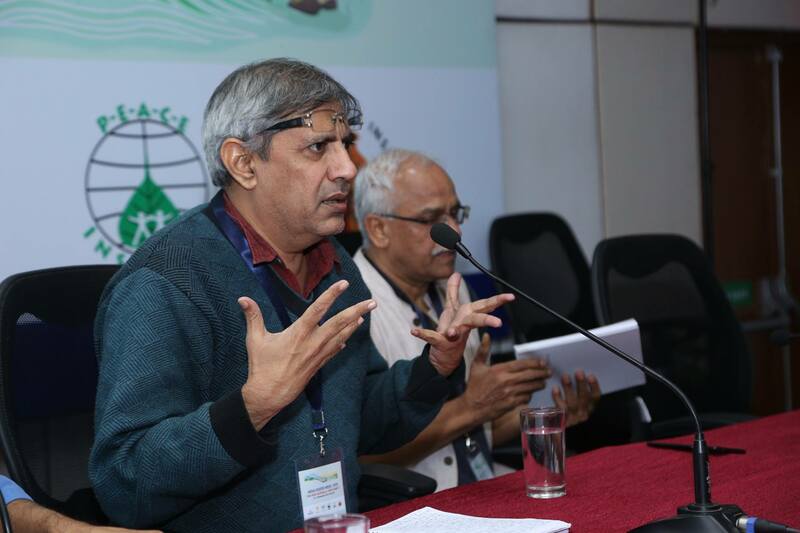 The first panel discussion of the event was centred on “Aviralta and environmental flows” and was chaired by Jagdish Krishnaswami of ATREE, Bangalore. 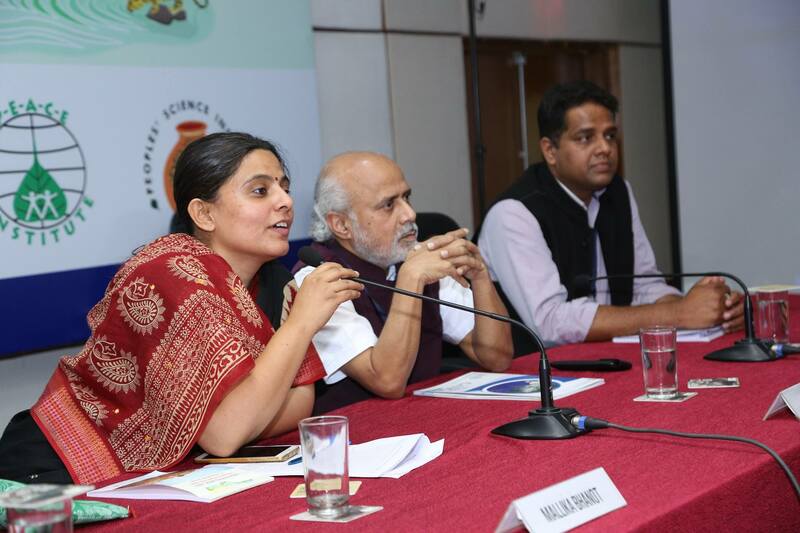 Participants included Dr Brij Gopal, CIWSA;Mallika Bhanot, Ganga Ahvan; Suresh Babu, WWF India and Dr Vinod Tare, IITK. 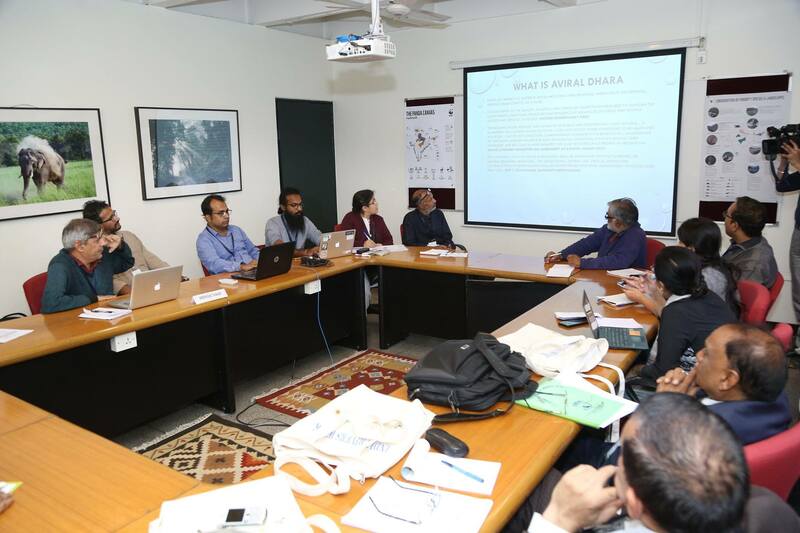 Later the participants discussed the activities affecting Aviralta in three breakout groups. 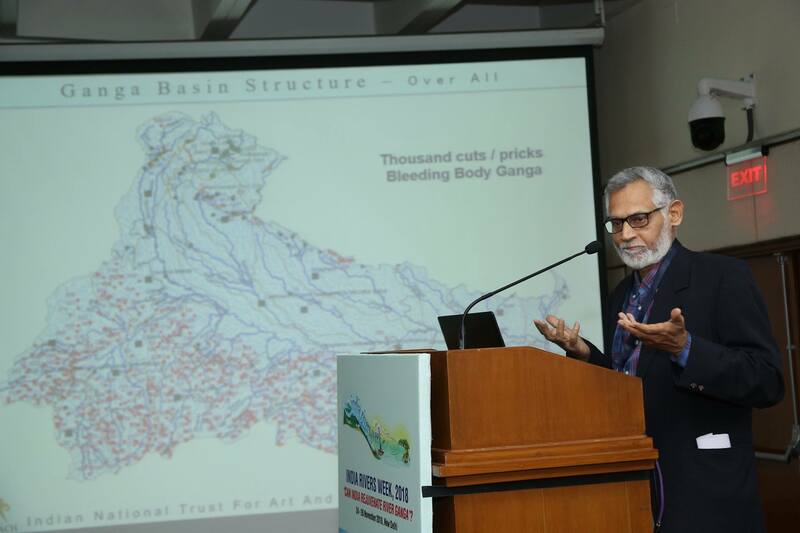 The themes were a) Flood plains, embankments, river front development, sand mining, dredging and inland waterways, convened by Shripad Dharmadhikary of Manthan Adhyayan Kendra; b) Dams, barrages and interlinking of rivers convened by Himanshu Thakkar of SANDRP, and c) Water use and allocations, convened by K J Joy of SOPPECOM. 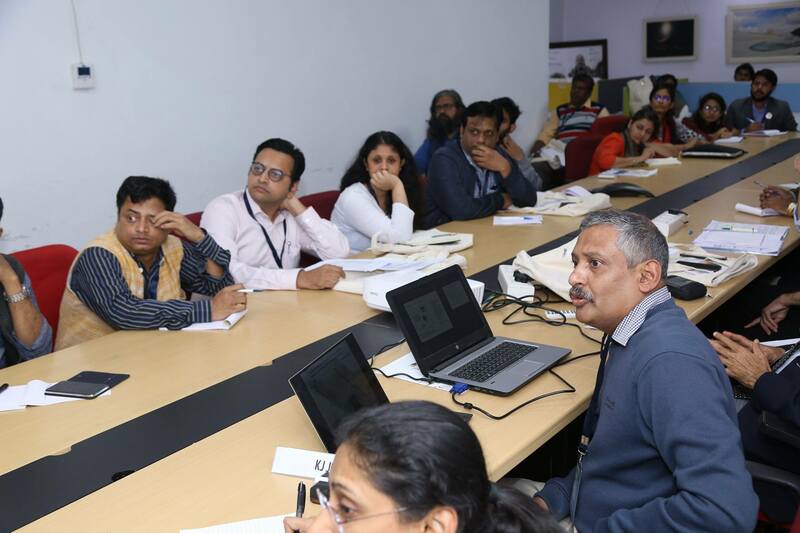 The convenors and participants of the break out groups presented their findings in the plenary chaired by S Vishwanath. 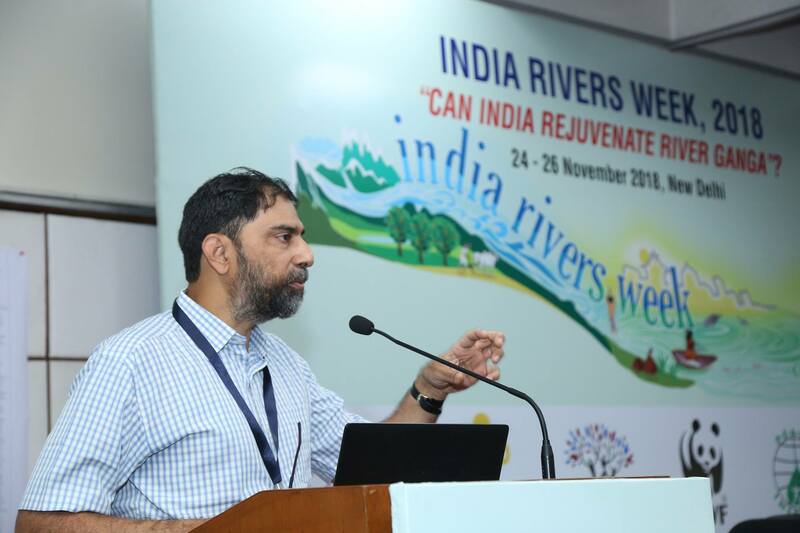 The day ended with the ‘River Lecture’ delivered by Dr Rajiv K Sinha, IIT Kanpur, on “Sediment management in the Ganga Basin”. 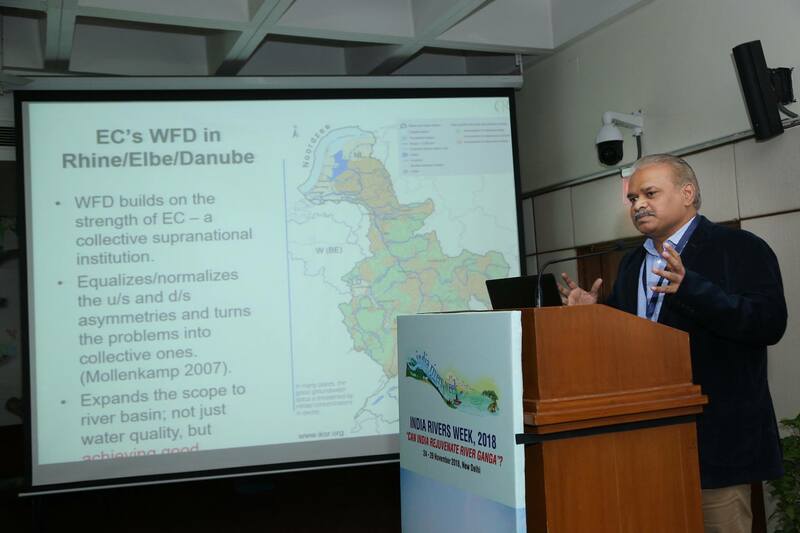 The second day kicked off with a series of presentations and a panel discussion on “Catchment and Delta integrity”, chaired by Manu Bhatnagar of INTACH, Delhi. 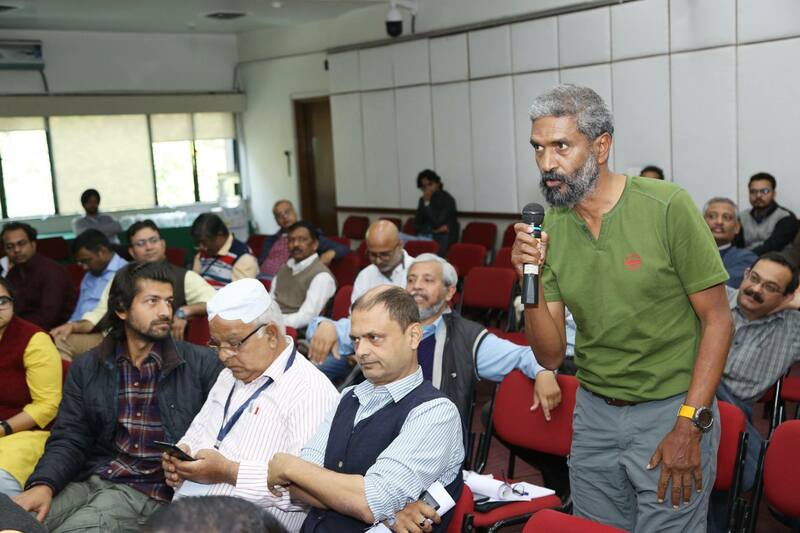 Participants included Jayanta Bandopadhyay, Jagdish Krishnaswami, ATREE, Vijay Paranjpye, GOMUKH, Anil Gautam, PSI, Rohit Joshi, and Makarand Purohit, IWP. 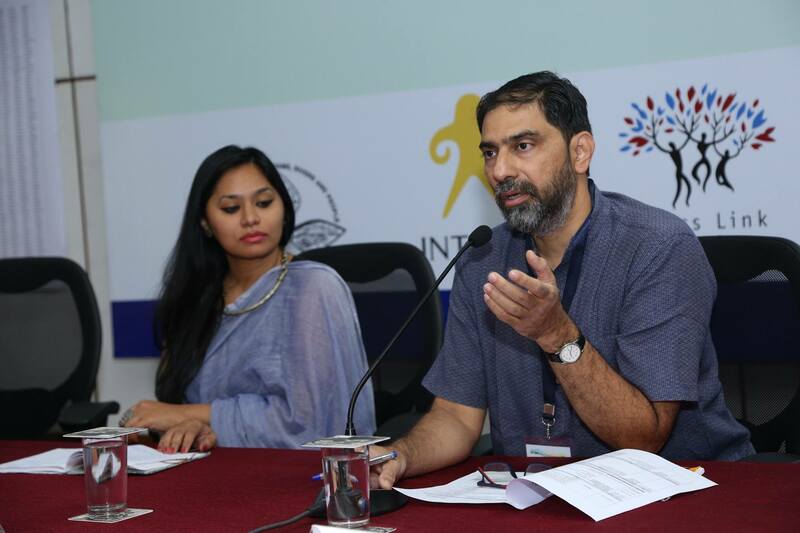 Vijay Paranjpye, making his presentation. 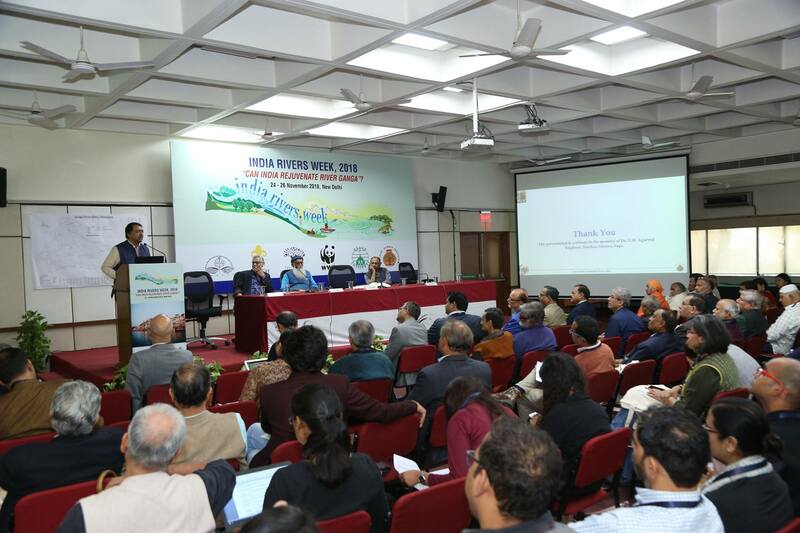 The second panel, on “Ecological integrity”, was chaired by Prof RK Sinha, and saw presentations by Rajiv Nair, IIT K, Tarun Nair, ATREE Shailendra Singh, ITA, Prakash Nautiyal, Garhwal Univ, Sunil Choudhary, Vikramshila Univ on Biodiversity, Dr Himanshu Kulkarni of ACWADAM presented on Groundwater – Surface water interactions. 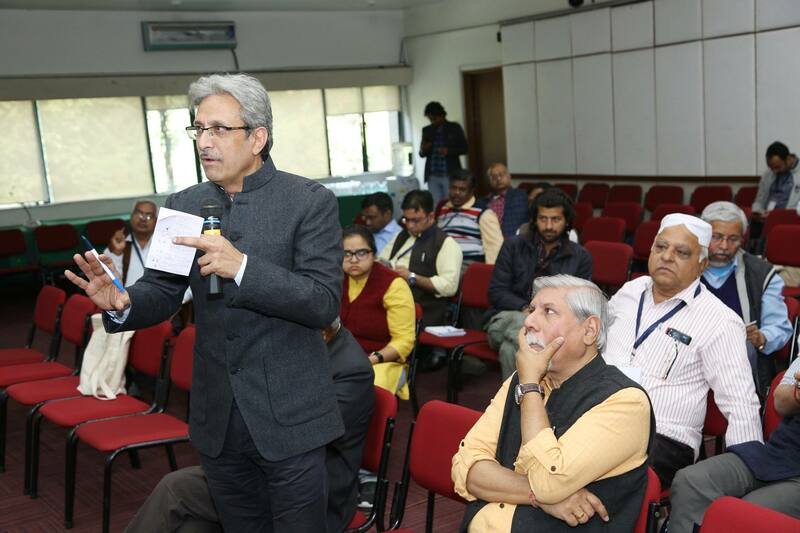 The post-lunch discussion was dedicated to the themes of Nirmalta and Climate change. 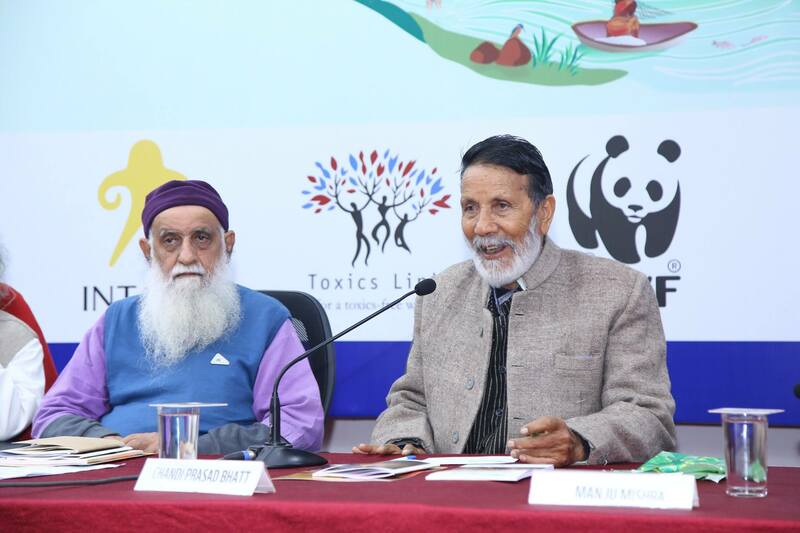 The former was addressed in a panel discussion on Pollution sources and mitigation strategies chaired by Dr Brij Gopal and saw participation by Prof T Velpandian, AIIMS, Ravi Agarwal, Toxics Link, Dhruba Das Gupta, SCOPE, Ritu Sinh, INTACH, Romit, WWF India and a representative from NMCG, Sitaram Taigor. 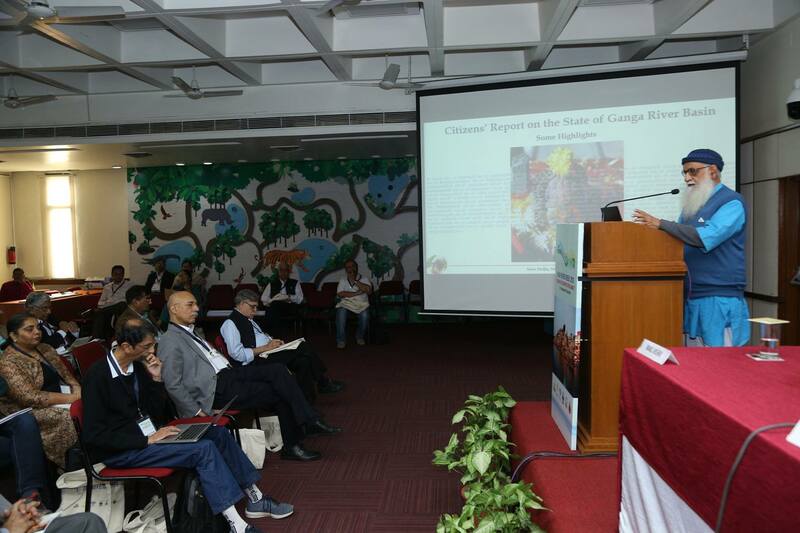 The second panel of the day was dedicated to readying the Ganga basin to face the potential impacts of Climate Change and was chaired by JR Bhatt, MoEFCC. 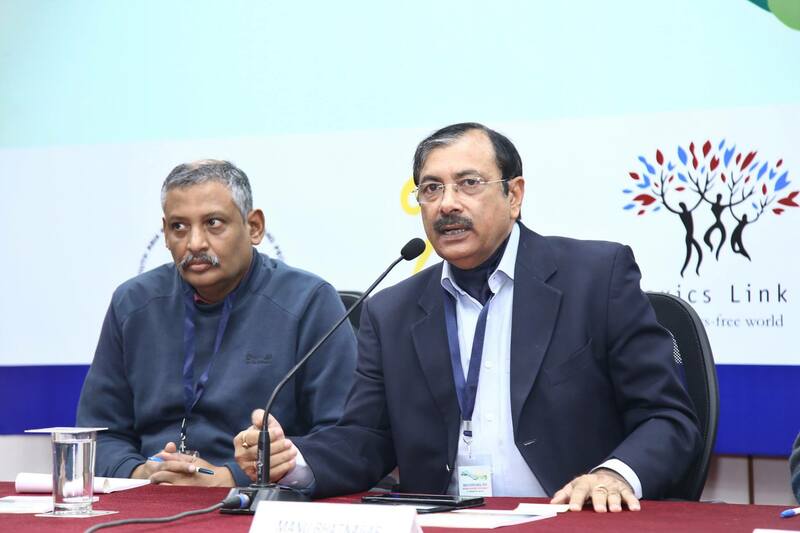 Participants in this included AK Gosain, IITD; jagdish Krishnaswami, ATREE; Joydeep Gupta, ThirdPole; Sreedhar, Environics Trust; and Nidhi Jamwal, Gaon Connection. 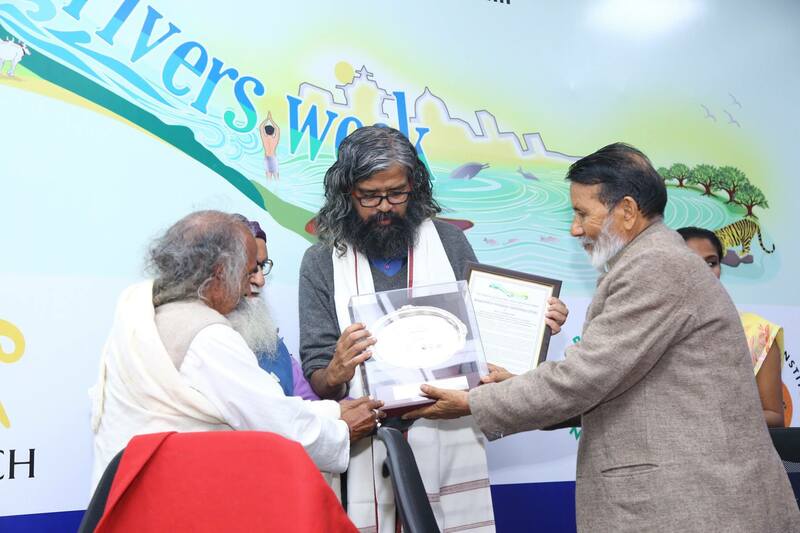 Vishwanath Srikantaiah, receiving the Bhagirath Prayas Samman award from the hands of Padma Bhushan Shri Chandi Prasad Bhatt, Swami Shivanand, Matri Sadan and Ravi Chopra, People’s Science Institute. 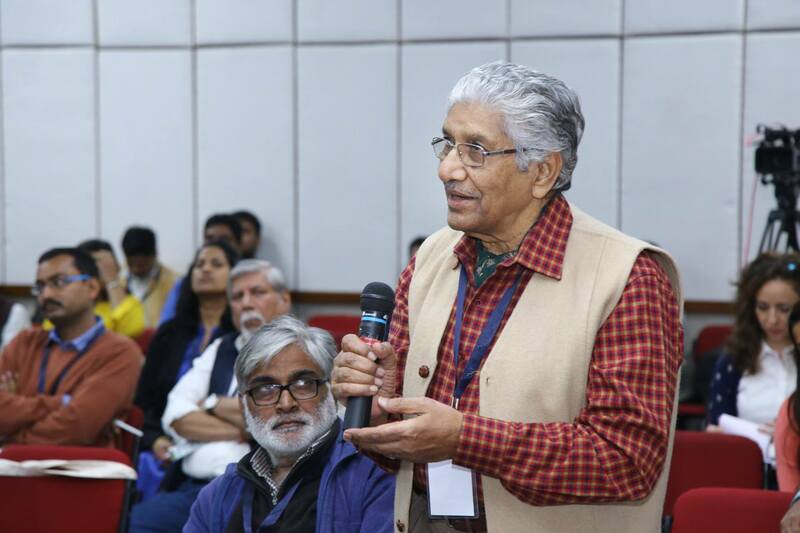 The final event of the second day was the awards ceremony for the Bhagirath Prayaas Sammaan (BPS) and Shri Anupam Misra Memorial (AMM) medal, presented by Padma Bhushan Shri Chandi Prasad Bhatt. 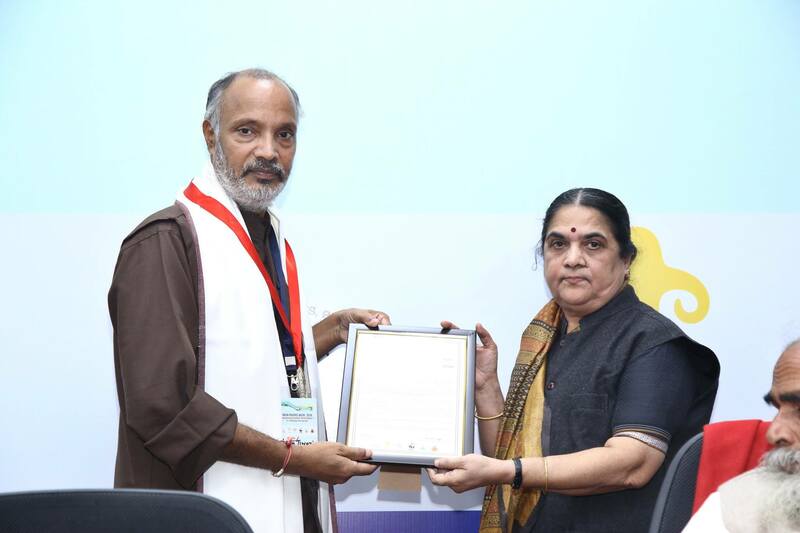 This year’s BPS award was presented to S Vishwanath, also known as Zenrainman, for his work on the revival of River Arkavathy and his unrelenting efforts to engage and educate common citizens, students and the government on groundwater recharge and rainwater harvesting. 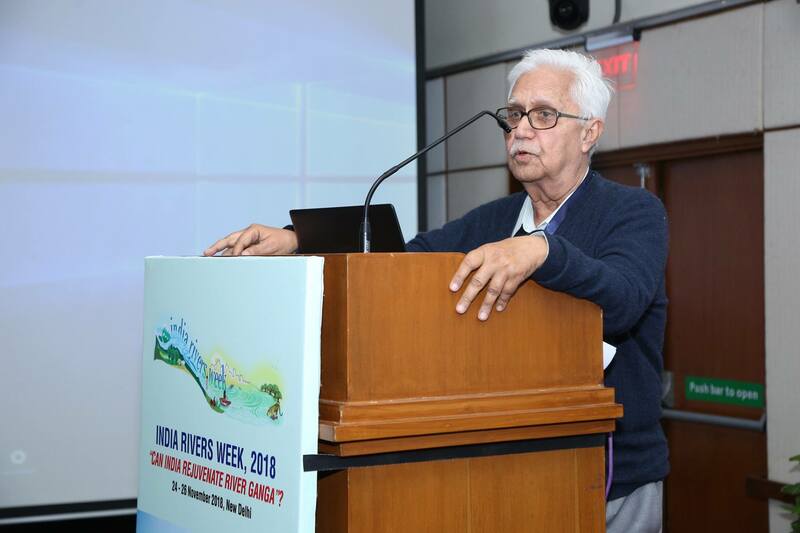 The AMM medal was awarded to journalist Arun Tewari, for his coverage of river-related issues, who also released a book of his on late G D Agrawal at the event. 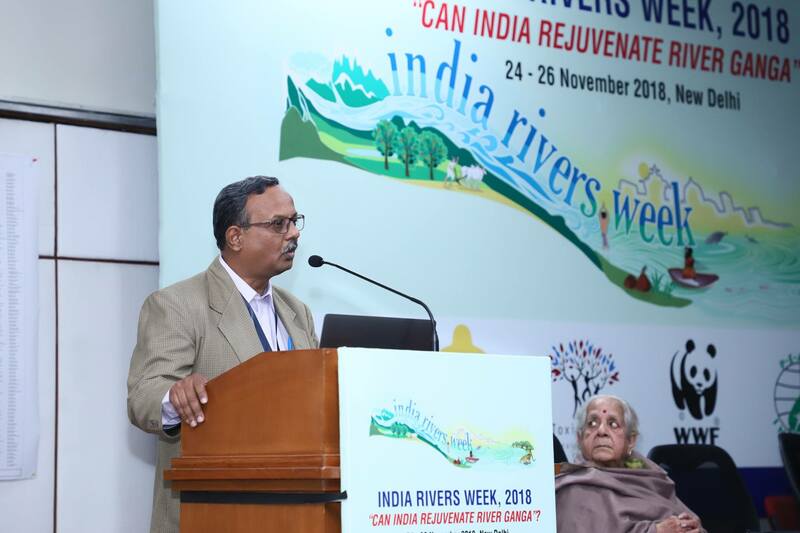 Srinivas Chokakula (CPR), making his presentation – Is system to compensate upper riparian states for ensuring Ganga’s Eco-system services to lower riparians feasible? 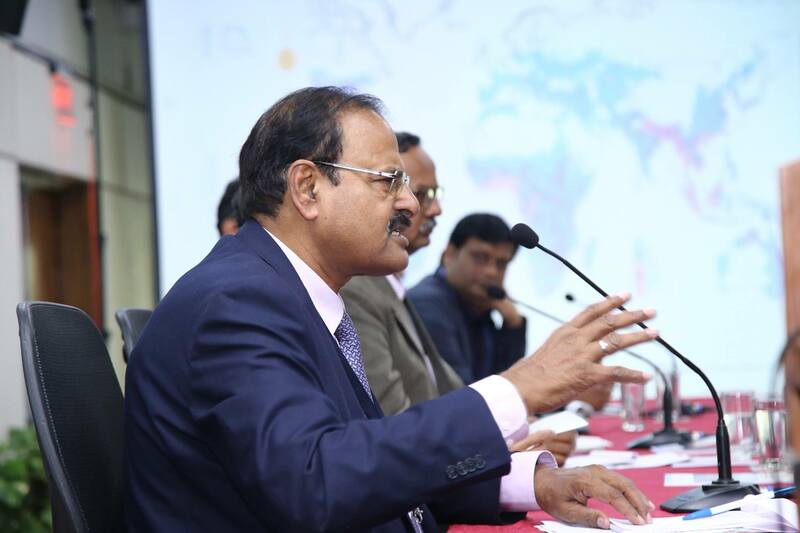 The last day of the event started with a session dedicated to special issues. 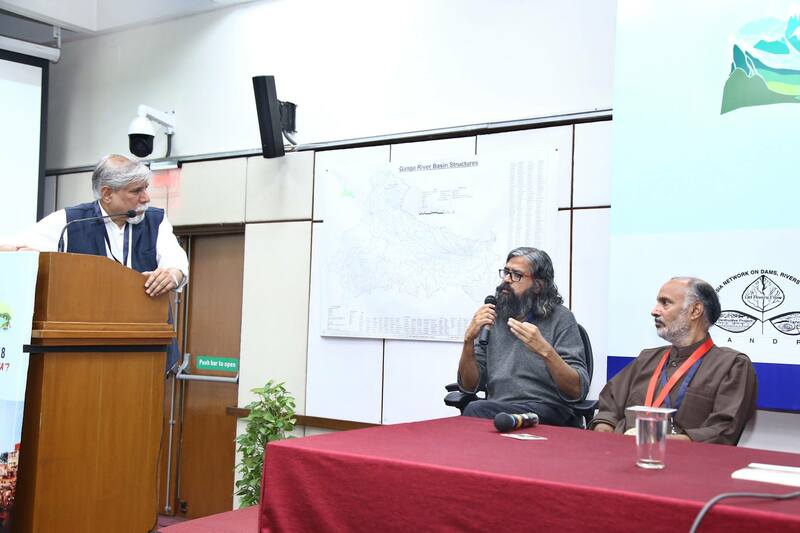 The themes discussed were “Preserving the unique characteristics of the Ganga” by K Khairnar of NEERI; “Ganga as a living entity” by Neha Sinha; “The possibility of the lower riparian states in the basin compensating the upper riparian states for eco-system services” by Srinivas Chokakula, CPR and “Walking up the Ganga” by Siddharth Agrawal. 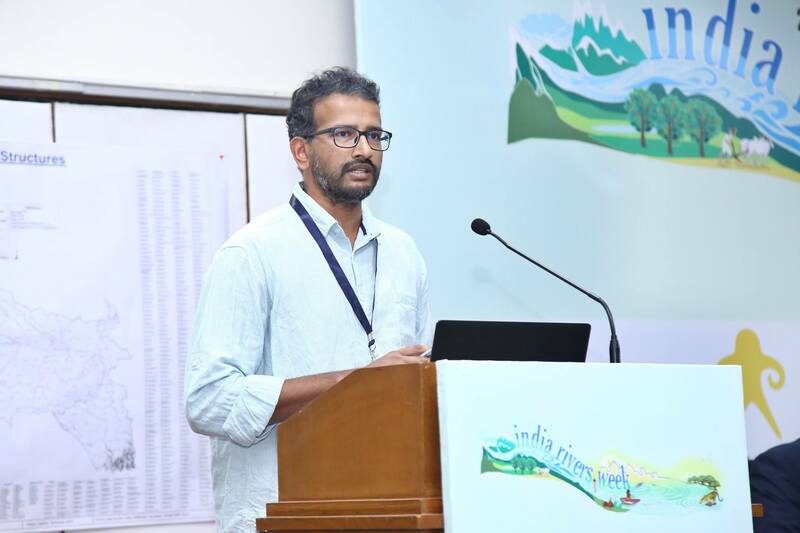 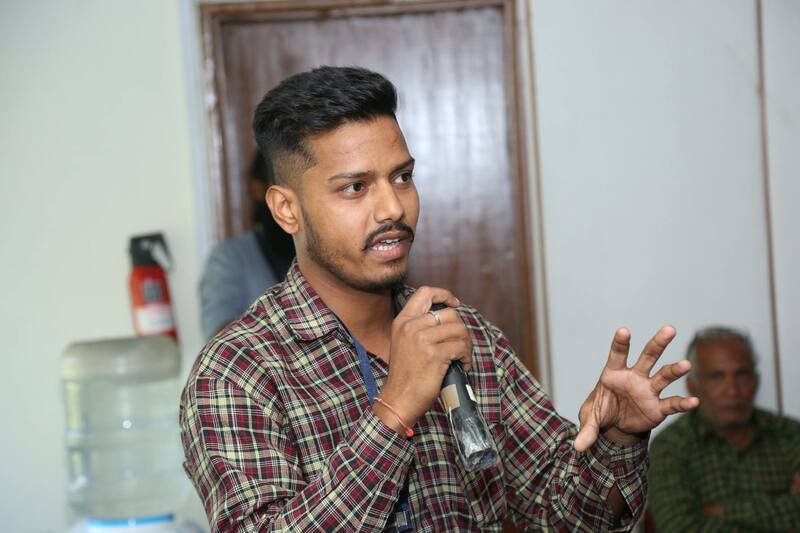 Marthand Bindana, Producer, also presented the trailer of his upcoming film titled “SuryaGanga” on Solar energy and how it could replace Hydropower. 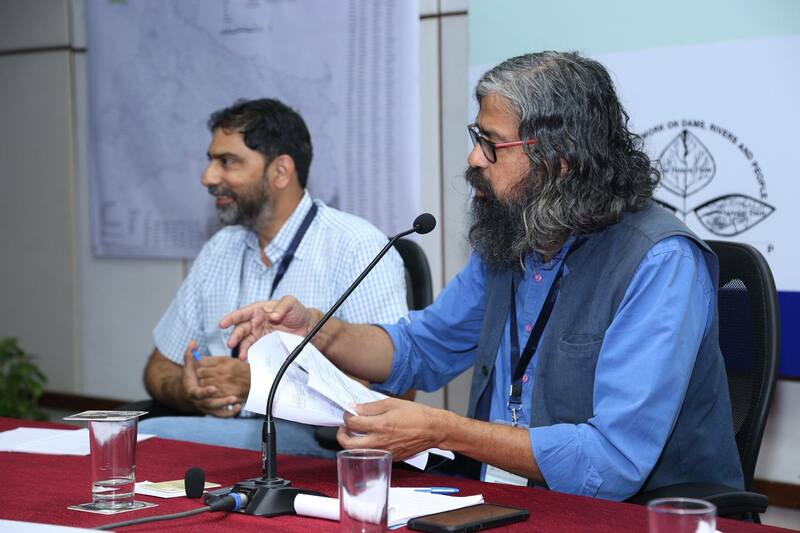 The final panel of the day was chaired by S Vishwanath, and the discussion centred around the “Governance issues in the Ganga Basin”. 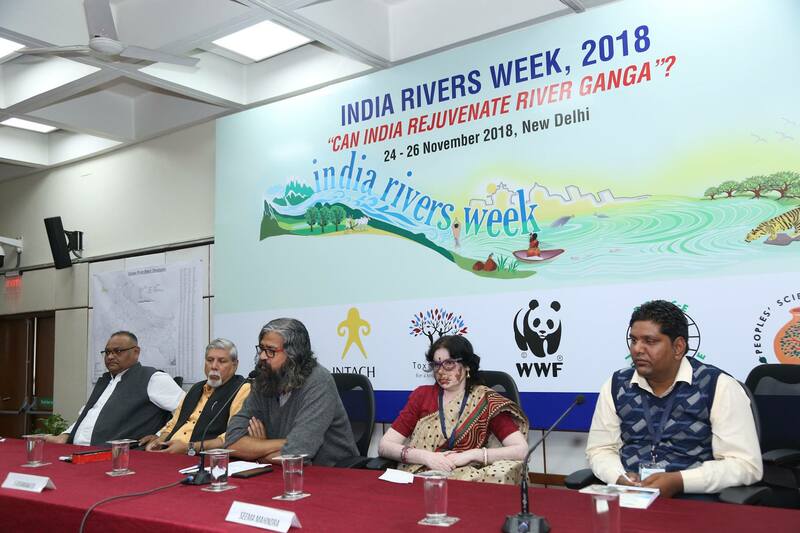 Participants included Sandeep Behera, NMCG; Abhilash Khandekar, Senior Journalist; Seema Mahindra, Ramganga Mitra; and Mushtakim, Yamuna Mitra Mandali. 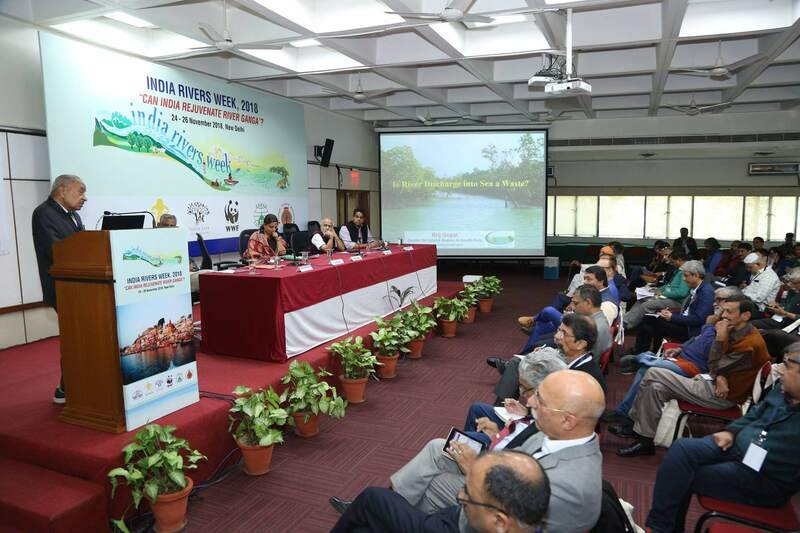 Panel Discussion: River Governance in Ganga Basin: How should Ganga be governed & its current state. 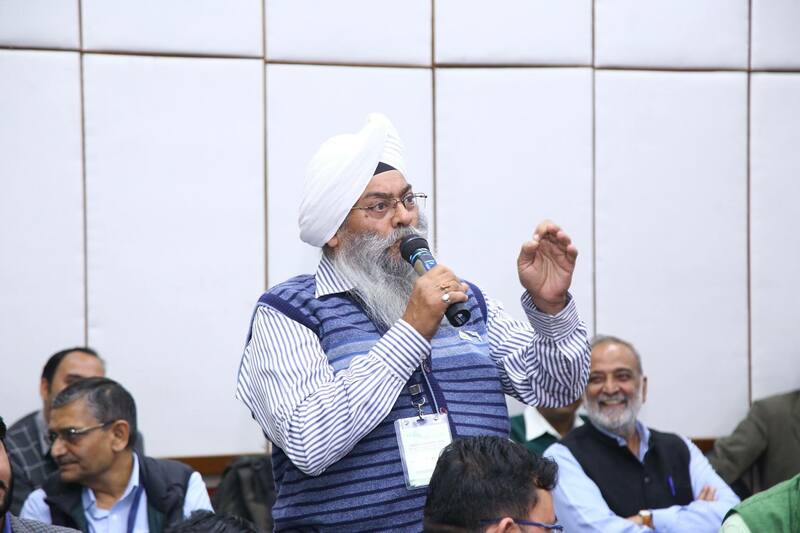 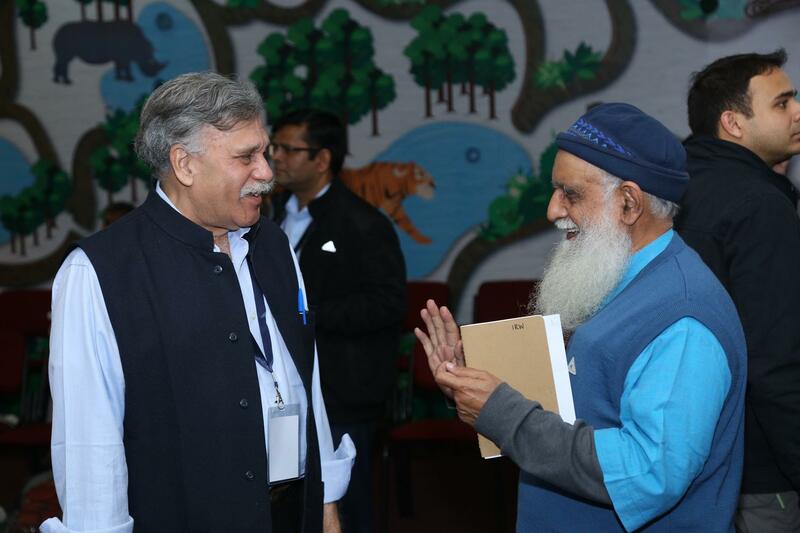 The discussion from the three-day event was summarised by Dr Ravi Chopra in his presentation on the “Way Forward” which included suggestions made by the participants over the course of the past two days and during the open house session in the morning. 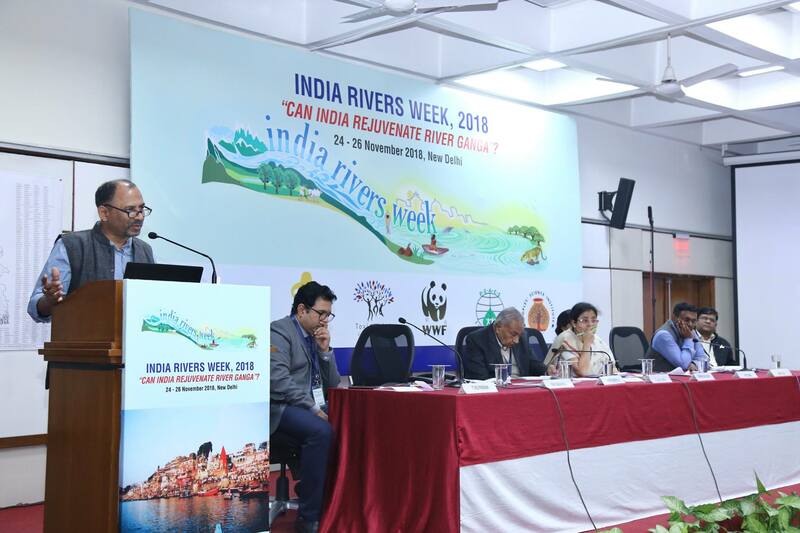 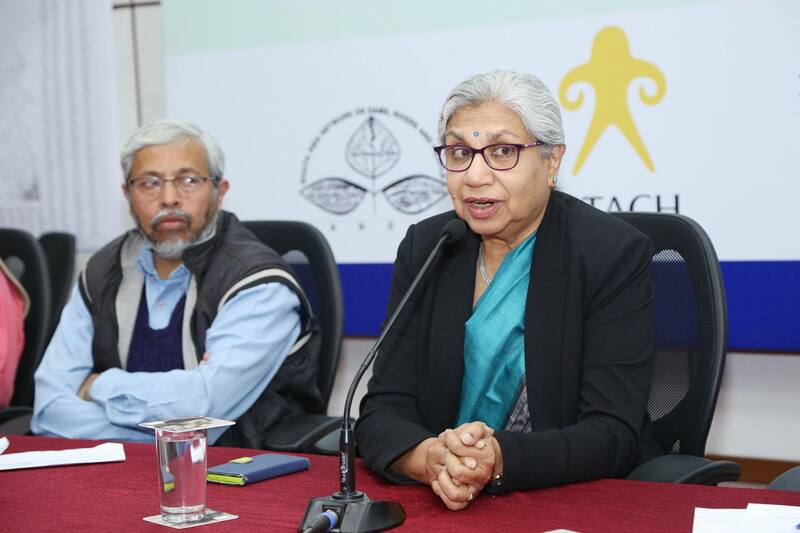 The consensus was presented at the Valedictory function, presided over by the Guest of Honour, Shailja Chandra, former Delhi Chief Secretary and the Chief Guest, UP Singh, Secretary to the Ministry of Water Resources, River Development and Ganga Rejuvenation, Govt of India.